'Stop The Maduro Genocide': Protesters March In Venezuela With U.S. Support Opposition leader Juan Guaidó called for nationwide rallies a week after he declared himself interim president and demanded Nicolás Maduro step down or call new elections. 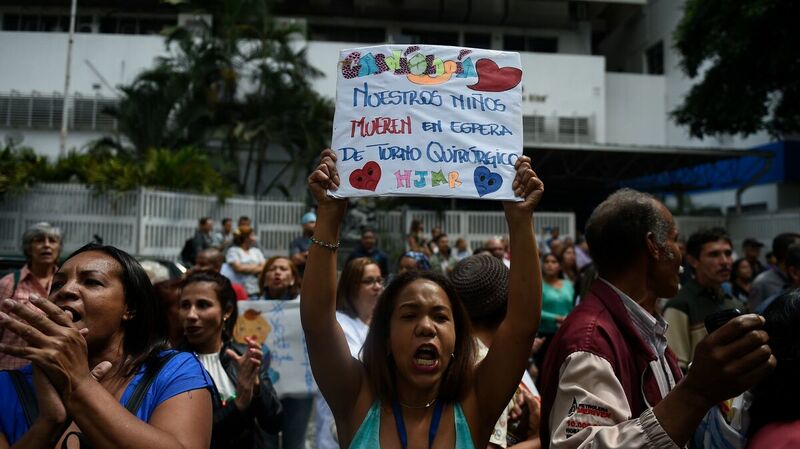 A protester holds a placard that says "Our children die as they wait for surgery" during a demonstration against President Nicolás Maduro on Wednesday in Caracas, Venezuela. Protesters filled streets across Venezuela on Wednesday in a show of strength for Juan Guaidó, the U.S.-backed opposition leader who has declared himself interim president and called for Nicolás Maduro to step down. Guaidó made a surprise appearance in front of a cheering crowd at the Central University of Venezuela in the nation's capital, The Associated Press reported. The demonstrations marked a week since the 35-year-old took the oath of office in Caracas. Guaidó was recently elected president of the country's National Assembly, and he says the Venezuelan Constitution grants him authority to lead the country because Maduro was re-elected last year through fraud. The U.S. has recognized Guaidó as Venezuela's interim leader and imposed sanctions to weaken Maduro. Trump spoke to the opposition leader Wednesday congratulating him "on his historic assumption of the presidency" and stressing "the importance of the large protests across Venezuela against former dictator Maduro," White House press secretary Sarah Sanders said Wednesday. Guaidó thanked Trump on Twitter for the phone call. Guaidó had urged Venezuelans to list their grievances on placards and stage a two-hour demonstration Wednesday beginning at noon local time. He found a receptive audience in Venezuelans who have suffered under Maduro's policies. Hyperinflation and a plummeting economy have caused widespread hunger and a shortage in medical supplies. At one hospital, a protester held a sign that said "Our children die as they wait for surgery." Medical students said a lack of supplies and medicines such as insulin are killing their patients. 🔴 "No hay ampollas ni insulina, nuestros pacientes se nos mueren cada día", gritan estudiantes que se unen a la convocatoria #TúTambiénTienesRazones en el Hospital Clínico Universitario. Economist Ricardo Hausmann told NPR's The Indicator that a Venezuelan earning a median salary would be able to buy fewer than two eggs on a day's wage. A survey from three universities in Venezuela found that citizens lost 24 pounds on average in 2017 because of the food shortage. Maduro's government has struggled to address the hardship and once drew ridicule for suggesting people eat rabbits to survive. Protesters on Wednesday used the word for "usurper" to describe Maduro. In the Caracas neighborhood of Chacao, protesters stood on a road and waved Venezuelan flags. One held a placard that said "Stop the Maduro Genocide." Maduro has shown no signs of relenting to the opposition. He retaliated by freezing Guadó's bank accounts and barring him from traveling overseas. Venezuela's chief prosecutor, Tarek William Saab, announced a criminal probe Tuesday into Guaidó's anti-government activities. In a video posted to Facebook and subtitled in English, Maduro accused President Trump of orchestrating a coup against his regime in an attempt to steal Venezuela's oil resources, and he warned the U.S. against military intervention. "Let us not allow another war like Vietnam in Latin America," Maduro declared. "Venezuela has a strong democracy. We have our own problems, as any other country, and we will solve them by ourselves." Maduro also joined dozens of evangelical supporters in a prayer session that was aired on state TV, appealing to an "all powerful God" to bless the nation, the AP reported. The U.S., in turn, has ratcheted up pressure on Maduro's government. On Monday, the U.S. imposed sanctions on Venezuela's state-run oil company, and a day later, the State Department said it had granted Guaidó authority to take control of Venezuelan government assets held by the Federal Reserve Bank of New York or any other U.S.-insured banks. The U.S. is Venezuela's biggest customer for oil, and production is expected to drop if Maduro remains in power. World powers have lined up on either side of the Venezuelan crisis. Some two dozen countries, including several Latin American nations, Australia, Canada and Israel, have backed Guaidó. A number of Western European countries have said they will side with him if Maduro does not call new elections. Russia and China continue to support Maduro's regime with loans and political support at the U.N. Security Council. Private military contractors linked to Russia's government are also rumored to be in Venezuela protecting Maduro, Reuters reported, citing sources close to the contractors. On Wednesday, Guaidó called on Venezuelan armed forces to "cross over to our side, the side of the constitution." So far, the vast majority of Venezuela's military has remained loyal to the sitting president and ignored Guaidó's appeals. On Wednesday, Maduro presided over military exercises and rallied rows of troops in green fatigues, invoking the liberator Simón Bolívar and former President Hugo Chávez and referring to the U.S. support of Guaidó as imperialism. "The sun is rising," Maduro said. "January is gone. And rebellious February, anti-imperialist February, is coming." Maduro has offered to talk with the opposition, but Guaidó is likely to refuse negotiations because he does not recognize Maduro as the leader of the country. Last week, Guaidó successfully summoned hundreds of thousands of people for protests, as NPR has reported. The U.N. said Tuesday that 40 people are believed to have been killed during the weeklong political standoff. More than half of them are believed to have been shot by security forces or pro-government forces while protesting, and one member of the National Guard is also believed to have been killed during protests. More than 850 people are thought to have been detained. Two French reporters covering the protests for the TV program Quotidien have been arrested, Reuters reports, citing a French diplomatic source. Guaidó has called for more protests on Saturday. Venezuela expert Bruce Bagley at the University of Miami said social protests and foreign pressure were unlikely to push Maduro out of office unless the military switched allegiances. "Maduro doesn't care how many countries condemn him," Bagley told NPR. "The fulcrum is the military." The U.S. intervention is welcome among Venezuelans who are fed up with Maduro, NPR has reported, but worries remain that any transition would be violent, as hard-line pro-government troops, police and militias hold fast. So far, Washington has leveraged only political and financial pressure on Maduro. However, in a Monday briefing, national security adviser John Bolton held a yellow notepad containing a scrawled note that read in part "5,000 troops to Colombia." The White House has repeatedly said that "all options are on the table" regarding Venezuela. The State Department has warned U.S. citizens not to travel to Venezuela because of crime, civil unrest and the risk of detention. All nonemergency U.S. personnel have been ordered to leave. NPR's Isabel Lara contributed to this report.